Here’s looking at you, kit. Very nice. 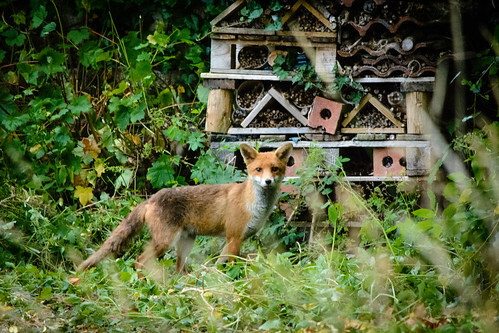 Saw this earlier on Flickr, great shot of a lovely creature. I’ve kept a number of exotics over the years but never a fox. Would love to have one around the house. My cats might not agree, however. Impressive, though of course it would be a very unwelcome sight in Australia. They are such elegant creatures. Only four comments? Very well, I’ll add one. This is yet another perfect composition, an elusive forest creature fortuitously juxtaposed with an eccentric assemblage of obscure materials, two opposing triangles framed by squares and circles. Foxes are rare where I live, yet I saw one not long ago in a corner of my yard. I thought at first it was a dog, but it vanished so impossibly that I had to look it up. Gray foxes can climb trees.